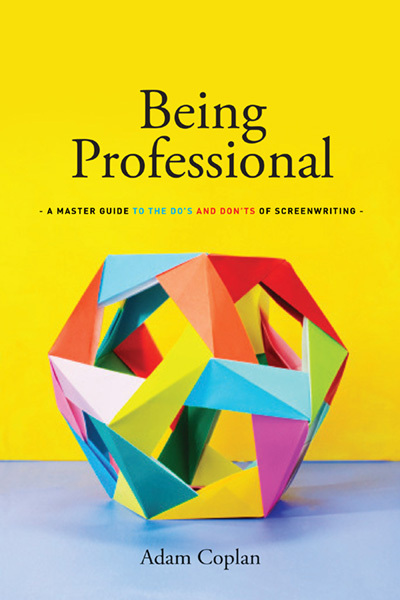 Being Professional by Adam Coplan is a great book to read if you are a professional screenwriter at the onset of your career and aspiring to become a working screenwriter. The book is designed to help you write the best spec script possible. A spec script is a screenplay you write on your own, without being paid, with the goal to secure representation, or your first paid assignment, or both. And if you are very lucky, you might even sell your spec script and see it being produced. So the emphasis of this book is about how to write a great spec script. The book focuses on the following topics: how to make the three acts structure work to your advantage; how to give your audience what they expect depending on genre; how to write great memorable characters; how to write an impactful opening scene; how to navigate the intricacies of the second act; how to develop your plot in small manageable increments; how to write a great climax and end of film; how to write great dialogue; and many more. The book is punctuated by numerous writing exercises to make you practice and assimilate the various concepts. A must read if you want to break into the entertainment industry as a working screenwriter.